The temperatures are rising and that means we will be outside more enjoying the warm weather. Unfortunately, this also means that pests like mosquitos, fleas and ticks will return in full force. Here is how those unwanted pests can affect your untreated pet. Heartworm disease is transmitted through the bite of an infected mosquito. Heartworms can cause lung disease, heart failure and damage to other organs. They are dubbed “heartworms” since they take up residence in the heart, lungs, and nearby blood vessels as adult worms. Symptoms can include a persistent cough, loss of appetite, fatigue and weight loss. If left untreated, it is a progressive, life-threatening disease, but can easily be prevented by year-round heartworm prevention. Ticks are typically found in wooded and brush-covered areas. They can spread serious diseases, such as Lyme disease, Ehrlichiosis, Rocky Mountain Spotted Fever, and more. Some symptoms of these diseases include fever, loss of appetite, lethargy, swelling of joints, and lameness. Be sure to inspect yourself and your dog after playing outside, especially in areas with lots of trees, brush and shrubs. If you do find a tick, the quicker it is removed, the lower the chances your dog will contract a tick-borne illness. If you are unable to remove the tick yourself, please consult your veterinarian. Fleas are most common in warm, humid climates. Fleas multiply very quickly and in addition to your pet, they can also reside in flooring, rugs, and furniture. An intense flea infestation can cause anemia, which can be life-threatening in severe cases. Flea bites can also cause allergic reactions for some pets, resulting in scratching, hair loss and scabbing. Once an infestation takes place, you not only have to treat your pet, but also your home. Please refer to your veterinarian for cleaning products that are safe to use around pets and children. Your veterinarian can recommend which flea and tick and heartworm prevention products are best for your pet. They can also perform an annual test to check for heartworm disease and several tick-borne illnesses. If your pet is already infected, your vet will be able to recommend appropriate treatment options. These links on heartworm disease and external parasites can also provide more information. Remember, prevention is the best treatment. 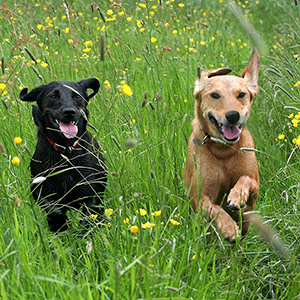 We hope you and your pets enjoy the Spring weather and stay happy and healthy!